These manta ray earrings feature the majestic form of a flying manta ray, mouth open wide as it swoops and somersaults through the water. Each earring dangles elegantly from the tail of the manta ray, which flows seamlessly into a fishhook back. Realistic details such as the eyes and gill slits underneath make these earrings truly unique. A great gift for divers and ocean lovers alike. Earrings are available in sterling silver or 9 carat yellow gold (white gold, rose gold and other metals also available on request). Silver earrings come in our signature World Treasure gift pouch and gold earrings come with a World Treasure gift box and bag. Free shipping worldwide on all orders. 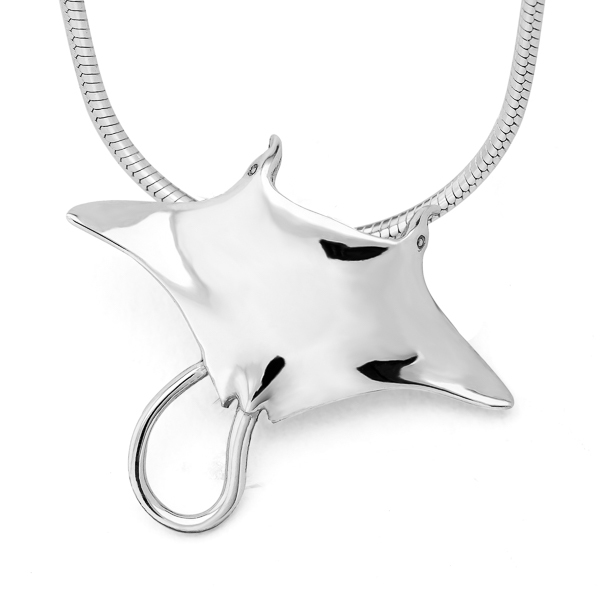 See the Flying Manta Ray Pendant for a matching set.